Our K-12 education programs' goal is to encourage students in Northern New Mexico to pursue science, technology, engineering and math careers. When the going gets tough, encourage students to keep going. 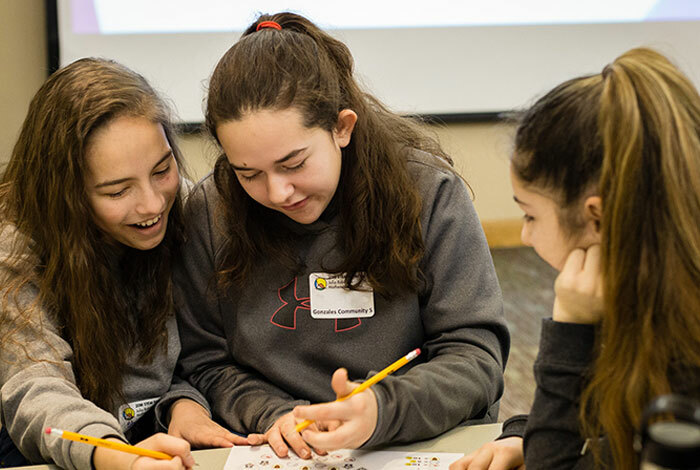 A national middle school coaching and competitive mathematics program that promotes mathematics achievement through a series of fun and engaging "bee" style contests. There are four levels of competition - school, region, state, and national. The Science Bowl tests students’ knowledge in all areas of science. Students are quizzed in a fast-paced question and answer forum. The Supercomputing Challenge is a program encompassing the school year in which teams of students complete science projects using high-performance supercomputers. RoboRave International is a robotics competition where two to four person teams work before the event to design, build and program their autonomous remote controlled robot to perform a variety of competition tasks. Future City Competition is a national, project-based learning experience where students in imagine, design, and build cities of the future. Students work as a team with an educator and engineer mentor to plan cities using SimCityTM software: research and write solutions to an engineering program. Approximately 40 interactive exhibits trace the history of the WWII Manhattan Project, highlight the Laboratory's current and historic research projects related to defense and technology, and focus on Laboratory research related to national and international economic, environmental, political, and social concerns. Open year-round. EHY is a hands-on math, science, technology, engineering and math (STEM) conference for girls in grades 6 – 12 led by women in STEM careers. These conferences are held in the fall and spring.